Capture data using the iGUIDE camera system. Complete all 10 exercises below to understand the basics of shooting. Here you will find all the answers to your iGUIDE camera system related question. There are a series of educational units, ordered chronologically, that you can use to learn how to operate the camera system. Let’s identify the parts. The circular feature on the top of the camera system is the laser scanner. That’s where the laser is emitted that measures everything in a room when a panorama is created. It measures a 270 degree field of view on a horizontal plane at the height of the laser scanner. You can change what gets measured by changing the camera systems height. The aluminum box on the side of the camera system is called the system controller. The small nub sticking out of the system controller is the WIFI dongle. The USB drive where all the data is stored is also plugged into the system controller. It is located under the DSLR body. The DSLR body is visible when standing behind the camera. All the settings should be left the same. The system battery is located on the side opposite the system controller. It doesn’t need to be removed to be charged. The panoramic rotator is located at the bottom of the camera system and is what you connect the the tripod or quick release plate. The lens is visible from the front. It has a 185 degree field of view in all directions. That means it can see the tripod and ceiling. It is fixed focus and fixed aperture. This means it is very robust because it has no moving parts. It’s prone to collecting dust and should be cleaned before starting a shoot and whenever it needs it. The spirit level that is inserted into the hot shoe mount is used to level the camera. No data is stored on the device, it’s all on the camera. All of the data is stored on a USB drive plugged into the system controller. Any USB drive can be used if it physically fits into the space provided. It’s a good idea to buy a few extra USB drives and leave them in your case so that if you forget one in your computer you can still capture data at a property. You can connect the camera to any smart device using WIFI. This is done by selecting the camera is the wifi source. Select the camera. It will be named planitarXXXX. Select Add to Home Screen to create an icon on the home screen for easy access. Open Google Chrome and enter the numbers 192.168.5.1 into the URL bar. The icon on the home screen has the advantage of loading the survey app full screen without the URL bar and is easier to use on smaller screens (phones). On android devices there may be an exclamation mark on the wifi icon signifying that the there is no outgoing internet connection. This is totally normal and can be ignored. When shooting a property, the connection process is very simple. As long as WIFI is on as the camera system is powered on your smart device will automatically connect to it via WIFI. All you must do is wake up your device and tap the icon on the home screen. This will load survey app to exactly where you left it. 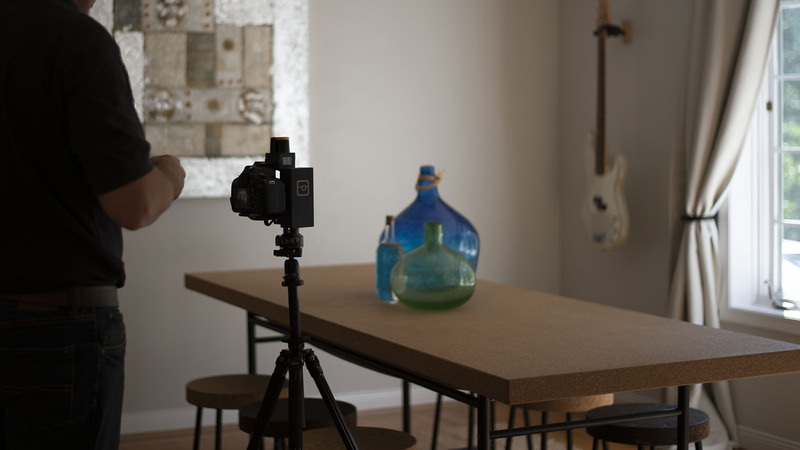 The first time you connect to the camera and when you are practicing at home you will have to manually select the camera because your device will usually be connected to your home wifi. When you have logged into the camera for the first time you should see the Projects screen, projects are separate properties that you are creating an iguide for. To create a project, tap in the field provided and enter in the number and street name for the property. You will also be required to enter in an exterior wall thickness. 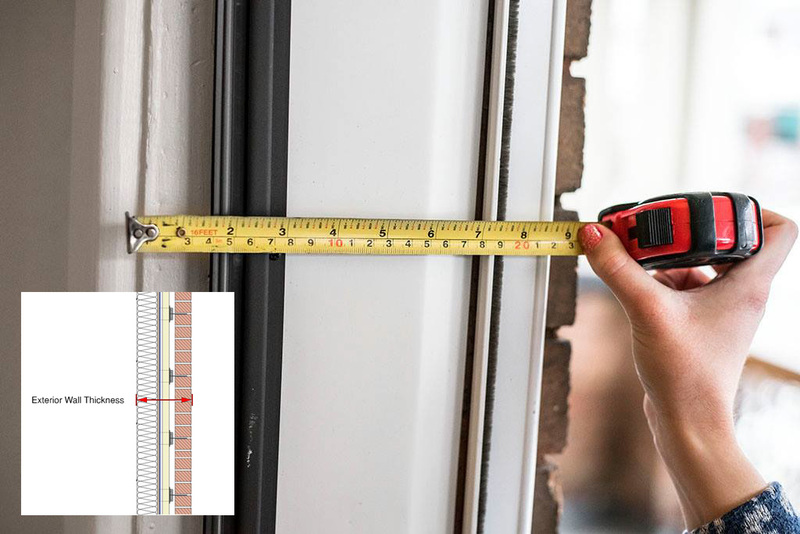 The exterior wall thickness should be measured at the front door with a tape measure or a ruler. Always measure the exterior wall thickness at the front door and ignore the trim surrounding the door. Imagine you are standing in a doorway and you turn to the right or left to see the wall edge on. Measure the distance from the inside of the drywall to the outside of the exterior (brick, siding, etc.). Once you have entered a project name the interface will automatically transition to the Floor screen. From here you can enter a floor name to map. Each floor is mapped separately. A floor represents any space that will have it’s own floorplan. This includes exterior buildings like guest houses or garages. Once you have created a floor the interface will automatically transition to the survey screen. This is where are the controls are for operating the camera and viewing the data you have collected. The Survey interface has buttons, indicators, tabs, and areas where image data or laser measurement data will appear. The blank white area is where image data will appear when images have been captured. The three small boxes in the top left hand corner of that area will represent shots 1,2, and 3 from left to right. They will be populated each time images are taken and can be tapped on at any time to view previously taken images or to reshoot them. NOTE: There is no way to delete a panoramas. You will have to shoot over a panorama to get rid of it. There are a series of tabs at the bottom that can be tapped at any time to access different screens. Tapping on the pano tab allows you to view a list of all the panoramas that have been taken on a floor and reselet them. A selected pano can be viewed, moved, rotated, and reshot. The Floor tab will allow you to select or create a floor at any time. The project tab will allow you to manage the projects stored on the USB drive by selecting, creating, or deleting them. The Project tab also shows you the remaining space left on the drive. The Manage tab will allow you to access key settings that will be useful for shooting troubleshooting and managing the cameras operation. There are a series of indicators in the corner of the survey interface. They represent, from left to right: system battery level, battery time remaining in hours and minutes, tilt, speed, and dslr battery level. The project name, current floor and current pano will always be displayed to the right of those indicators. The rest of the button will be explained in subsequent sections. Creating a panorama is the most important operation that the camera system does. When a panorama is created the entire space within range is measured and photographed. Multiple panoramas for different spaces are then combined to create an entire representation of the house in raw data. This raw data is then used by professional drafts people to create the iguide and draw floor plans. The images are just as important as the laser measurement data in this process. When the drafter look at the measurement data they will often refer to the images to determine what was measured. Office filing cabinet example. Turn the lasers on by tapping the toggle button beneath the word laser. This will only have to be done once per shoot and is required for measurements to be taken. Press the +1 button. This creates a name in Survey for the panorama. This name will be a number starting with 000 and growing by one each time the button is subsequently pressed. It will also be visible next to the house name and floor name at the bottom of the interface. Panoramas can be given custom names from the Pano screen. This is a handy feature if you want to label a pano for room labelling later. Place the camera in a space that you wish to measure. It is not required that it be in the middle of the room or anywhere in particular but the camera should have an unobstructed view. Because a 360 degree panorama doesn’t require the same kind of framing as a regular still image, the cameras location it is much more flexible with regard to the images. Point the camera at something of interest or something that identifies the space. The first thing people will see when they load the panorama later will be what it was first directed at. Rotate the camera slightly to confirm that it is resting in one of the three positions on the rotator. It doesn’t matter which of the three positions you choose and you can ignore all of the markings on the rotator. It is preconfigured during assembly. Level the camera using the spirit level on the dslr hotshoe mount. Level the camera at the start of each panorama and don’t change it when transitioning from the first position to any subsequent ones. Tap the button on the back of the dslr that turns on the live view. To the right of the viewfinder, next to a red dot, with an image of a camera back on it. This will turn on the cameras LCD so you can see what the camera sees. While looking at the dslr tap the rectangle in survey that says daylight, this is a white balance selection and will affect the colors of the panorama images. A dropdown will appear with white balance options to select. Select different option and look at the lcd to judge their accuracy. Choose the white balance that suits the scene by eye. Rotate the wheel on top of the dslr that’s net to the shutter button. This will control the brightness of the image that appears on the lcd. Choose a suitable brightness for the scene. Tap the button that looks like a camera body or the Shoot Panorama button. The camera will take three pictures and merge them in camera to create an HDR composite images. You will see a box that says processing image while this takes place. When complete a preview image will be displayed that can be pinched to zoom. Rotate the camera clockwise to the next position on the rotator and tap the Shoot Panorama button again. Another preview image will appear representing the scene that was just captured. Rotate the camera clockwise to the next position on the rotator and tap the Panorama Shoot button for one final time to capture the last image required to complete the panorama. When complete the three thumbnail images for the shot indicators should be populated with three distinct images. The laser measurement data for the space has also been captured but isn’t visible. Tap on the small white icon in the corner of the grey box in the bottom right hand corner of the main preview image. This will cause the canvas to expand allowing you to see all the data that has been captured thus far. LIGHT BLUE: This is laser data that has just been captured or that has been selected. DARK BLUE: This data represents all the measurements for all panorama that are not currently selected. This data cannot me moved or rotated. GREY: This data is gathered during automatic mapping mode. It cannot be moved or selected. GREEN: This data represents what is in the camera systems field of view. It’s what the camera is currently seeing in real time. YELLOW: When a move button is tapped the light blue data will change to yellow signifying that it can be moved on-screen using one finger and drag. Two fingers and drag to rotate. With a panorama created and while looking at the grey canvas tap the button beneath the word PANO that says MOVE. This will cause the light blue data to change to yellow signifying that it can now be moved on screen. Use one finger to drag the data into place. Use two fingers to rotate the data into place. The compass in the camera will try to orient all the data in the same direction so only a small amount of rotation is required. The panorama just created will always appear directly on top of the previous panorama that was taken which means that data should always appear near its proper location. The purpose of moving data is to align data from each panorama so that it overlaps and is in the correct position relative to all the rest of the data. Always leave your first panorama in its default location and align any following laser data to that first pano. Align the data from the most recently created panorama to any previous panoramas. When every space has been captured tap the coverage button and confirm that the whole house has been covered. Go back to any spaces that require more coverage if required. Creating a panorama with a mirror in its field of view will cause some unusual data to be gathered. The mirror’s surface cannot be measured. Instead, what is reflected in the mirror is measured. This causes data to appear in unusual places. This extra data can be ignored. It may make room alignment more difficult so sped extra time to align rooms in Stitch. Stairs must me show in at least one panorama for the drafters to know their location and orientation. Panoramas are not required on stairs or landings unless they capture extra data that may be useful for the drafting process. Camera height should be kept at roughly 4ft. This makes operating the camera comfortable and creates a visually appealing floor to ceiling ration in the panoramas. The height of the camera can rasied or lowered at times to change the data that is collected. Raise the camera to measure over objects or lower the camera to collect data from a railing lower than 4ft. Raise the camera in areas with fixtures so they will be visible in the images. The drafters will need to clearly see any elements that are to be drawn into premium floorplans. Shoot properties with all the doors open unless they hide something that should not appear on the tour. This will make it easier to align the data because the cameras laser will be able to see into adjacent room created more overlap between panoramas. Every space in the home need to have a panorama created within it to capture the space visually in the images and to gather laser measurement data. The only exceptions to this rule are spaces that are not big enough to enter. Walk in closets need to be measured but broom closets do not. Connecting spaces like hallways and landings are critical to drafting the property and must always be captured. If you experience any problems while using the survey app there are a few easy things you can do that may fix it. Tap the refresh button. This will reload the app from the camera. No data is lost and the app will start exactly where it left off. Restart the camera. Turn the camera off and reconnect to it again. The survey app will start exactly where you left off. Change the WIFI channel. If there is interference on a give channel due to traffic volume the camera may not respond correctly to inputs. Turn off mobile data. Very rarely, the browser may not be able to access the survey app if mobile data is enabled. From the manage screen in Survey tap the button that says “Safely remove UB drive” remove the USB drive and reinsert it. If you are not able to locate the camera in your device’s list of WIFI sources you can try the following. Turn your device’s WIFI off and then back on again. This will force your device to rescan WIFI sources. Switch the WIFI dongle with the usb drive. If you are comfortable with the camera system please move on to the Stitch software section to learn about post processing the iGUIDE data!